Hello everybody! I'm here today with a new card. 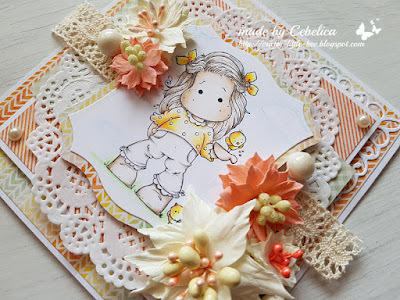 I decided to play with another recently released stamp from Magnolia's Sunbeam collection - this time I chose Tilda with little chickens. Isn't she a cutie? I really like this whole collection. I stamped the image on neenah solar white paper and coloured it with pencils. It's hard to see in the photo, but I also played with my pencils to create background. I made the flowers myself. I used Whimsy stamps Lily flower die set, Rosy dot AC3 dies, several different stamens and 2 different colours of foamiran. Other embellishments I used on my card are white berries, lace, pearls and paper doily. I also used one of the newly released doohickeys - Wedding lace. Papers are from MME. Beautiful thanks for joining us at Simply Magnolia DT Maria "tinyworks"
How pretty this looks in the soft peaches and cream colours Cebelica, many thanks for joining in with our 'One for the Girls' theme at Stamping Sensations challenge. 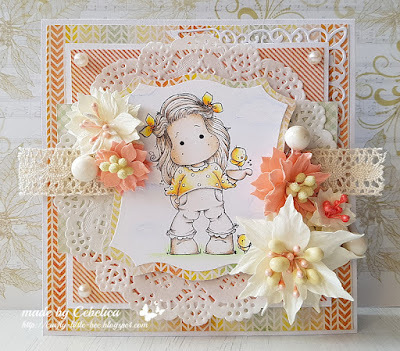 Beautiful stamping and such an adorable card. ♥ this. Thanks so much for entering into our current challenge and good luck in the draw. Such an amazing card! Thank you for taking part in the Noor! 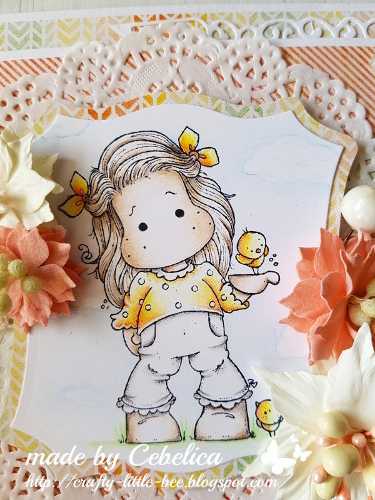 Design U.K. April Challenge! Superb design and colors! I love this soft orange and your bouquet is splendid! Thanks for playing at Love to Scrap!